In the early hours of August 13, 1961, the border crossings between the eastern Soviet Occupied Zone of Berlin and the western American, British and French controlled sectors began to be sealed. At first barbed wire was used to separate East from West Berlin, but over time this was replaced by concrete slabs and a deadly no man's land that became known as the Berlin Wall. The Wall split a city, a people, and the world, tearing apart families and friends for decades, and becoming a powerful symbol of the Cold War, representing the deepening divide between East and West, physically, politically, and philosophically. Well before the D-Day invasion of mainland Europe, the three main Allied powers, Britain, the United States, and the Soviet Union, held high-level discussions to determine how to administer Germany after it had been defeated. Eventually it was decided that Germany would be split into four administrative zones, one each for the Soviets, the American, the British, and the French. Berlin, as the German capital, was also to be divided into four administrative zones. However, Berlin was located deep within the zone allocated to the Soviets, 180 kilometres (110 miles) from the western zones, and this geographical fact was to haunt post-war Germany for many decades. Immediately after the war, the major concerns of the administrative powers were feeding the populace, and coping with the severe winter of 1947. The major political discussions were disagreements over the amount of reparations Germany could pay while still leaving it with sufficient resources for recovery. However, the "Berlin Problem," as it came to be known, was also beginning to surface. Post-war military rule by the four powers was intended to be a short term measure, as it was assumed a suitable German civilian government would be quickly formed, and the Allies would then sign a peace treaty with this new authority and withdraw their troops. As a result, there was little or no long-term planning in regards to the peculiar problems of Berlin. Access routes from the western zones were only tenuously agreed upon with the Soviets. The notion that both Germany and Berlin would remain divided for an extended period was just not considered. When relations between the Soviet Union and the Western powers began to deteriorate, all sides found themselves with a geographical problem that caused political problems. The Cold War heats up. The first major crisis between East and West regarding post-war Germany began on June 24, 1948, when Western land access to Berlin was blocked by the Soviets. Berlin relied on shipments of almost every good its population used, from food and medicine to coal for heating and power generation. At first it appeared that the Western powers would be forced to either abandon their sectors of Berlin, or open a land passage to Berlin through military confrontation, risking a possible Third World War. Unexpectedly, however, it proved possible to supply Berlin with the bare essentials (and no more) through a massive airlift operation. The New York Treaty of May 4, 1949 effectively ended the Berlin blockade, and the Western counter-blockade, and supplies quickly returned to normal levels. The blockade effectively ended the charade of four power cooperation in the administration of Germany and Berlin, with the Soviet sector eventually becoming the German Democratic Republic (GDR) and the Western sectors eventually becoming the Federal Republic of Germany (FRG). In both cases, however, Berlin was considered the capital city of these new countries, but a Berlin divided between the Soviets and the West. The events of the blockade were also a fundamental impetus behind the formation of the North Atlantic Treaty Organisation (NATO), and its Eastern counterpart, the Warsaw Pact, further defining the divisions of the Cold War. 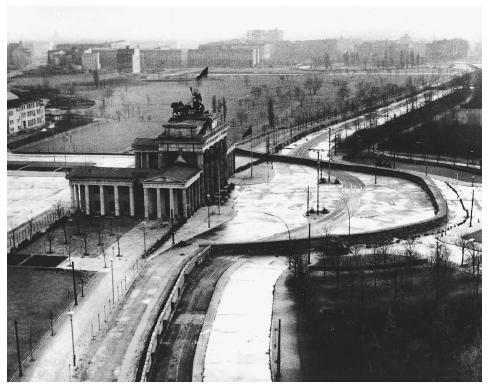 The Brandenburg Gate was sealed off by the Soviets in the Soviet-occuppied sector of East Berlin in 1961. Located at the center of the German capital, the gate stood at the divide between East and West Berlin until the wall was torn down by German authorities and citizens in 1989.
crossing the borders each day. Many East Berliners worked in the West, where they could make more money and so enjoy a higher standard of living than those working in the East, a situation that led to resentment from some. Berliners from the West enjoyed the extra spending power their currency offered in the East, crossing the border for less expensive haircuts, clothes, and other goods and services. Relatives living on opposite sides of the city could visit each other, students crossed to attend schools and universities, and many people crossed the border to attend concerts and sporting fixtures. There were some measures introduced to make crossing the border difficult and frustrating, such as police controls on many crossing points, and the barricading of some streets, but over 80 access points still remained open, and the underground railway (S-bahn) still crossed regularly. However, there were a large number of people crossing from the East who simply did not return. Towards the end of the Second World War there had been a flood of refugees fleeing from the East to the West ahead of the advancing Soviet army. While the tide slowed after the end of the war, there remained a steady stream of Germans who left the East of the country and resettled in the West. It is estimated that more that two and a half million East Germans fled into the West between 1946 and 1961, yet the entire population of East Germany was only 17 million. The East German authorities attempted to restrict their citizens crossing by introducing passes and making "fleeing to the Republic" a crime with potential jail sentence of up to four years. There were many factors driving the refugees. Some were as basic as seeking a better job, more food, or more material goods. The numbers of refugees spiked upwards during times of hardship in the East, when food and other essential resources were scarce. The social and political changes that had taken place in the Soviet zone, such as the educational reforms and the removal of many judges from their positions, resulted in many educated and wealthy persons moving to the West. The refugee problem grew and became an embarrassment for both sides. The East viewed those leaving as traitors and the West could not cope with the scale of the human tide. In the first seven months of 1961, over 150,000 East Germans left for the West. Walter Ulbricht (1893–1973), the leader of East Germany, repeatedly requested that he be able to take radical measures to stop the problem, but he was denied, at least for the time being. The Berlin crisis. Aside from the refugee problem, there were political troubles that threatened not only the peace and stability of Berlin and Germany, but also the world. In 1958, the Soviet Leader, Nikita Khruschev (1894–1971) demanded that several thorny post-war issues be resolved within a six-month period. The Soviets wanted negotiations on European security, an end to the four-power occupation of Germany, a final peace treaty signed with a reconstituted Germany, and the creation of a nuclear-free Germany to act as a buffer zone between the two superpowers. The Soviets threatened that if their demands were not met then they would sign a separate peace treaty with East Germany, officially splitting Germany in two (even if in practice it already was so.) Summit talks were held in Geneva (May-August 1959), Paris (May 1960), and with the newly elected President John F. Kennedy (1917–1963) in Vienna (June 1961), but no agreements were forthcoming. On the night of August 12, 1961, on the Eastern side of Berlin, large numbers of army units, militiamen, and People's Police (Vopos) began to assemble near the border. Beginning shortly after one in the morning the troops were posted along the border, and the wire and posts were deployed to seal East from West Berlin. Traffic was prevented from crossing, including the underground railway trains. When Berliners awoke on the morning of August 13 their city had been split in two. The closure of the border between the two halves of Berlin came as a surprise to Western intelligence agencies. After the fact, a number of reports and individuals surfaced claiming to have foreseen the events of August 13, but at the time there was no credible source that was believed by the West. Some historians have suggested there was an overload of information at the time, with too many spies and informers supplying information. Sorting through the sheer volume of reports was one problem, as well as sorting the useful signals from the noise of half-rumor and disinformation. Reports from civilians who noticed that something "big" was occurring before the border was sealed were dismissed, as they were considered less reliable than the professional spies and informers. Credit must also be given to the secret planning and execution of Ulbricht, Erich Honecker (1912–1994), and their forces, who managed to stockpile 40 kilometres of barbed wire and thousands of posts without arousing suspicion. Even as the border was being sealed, many people on both sides had no idea what the ultimate purpose was, including those laying out the barbed wire. The initial Western lack of response was baffling to many, who expected a more aggressive approach from the Western military in Berlin. The Kennedy administration appeared to accept that the Soviets had a natural right to protect their borders, and the other Western leaders followed his lead. Despite the fact that the East German actions violated the agreements the Four Powers had made after the Second World War, the United States only protested in a feeble manner. While Kennedy has been criticized heavily by biographers and historians for doing nothing, in effect, the lack of an active Western response stabilized the situation. While tension remained high for the next two years, the walling of the Berlin border did not threaten to boil over into armed conflict in the same manner as the Berlin Blockade had done. If there had been too much intelligence information before the Wall, after the border was sealed there was the opposite problem. Before the Wall, spies crossed as easily as anyone else did. The massive tide of refugees that moved to the West Berlin before the sealing of Berlin caused many intelligence problems, as it was simply not possible to effectively screen all potential communist agents when the numbers crossing were high. After the wall, it became much harder to send spies across the border, simply because there was no longer any civilian traffic. Potential spies were now much easier to spot, and security forces on both sides could now shadow all suspected persons in official parties who crossed the divide. Over the years, the East Germans modified and added to the initial barbed wire fence between the two Berlins. As soon as it became obvious that the West was not challenging the erection of the barricades, the first concrete sections were moved into place. Within the first few months, the Wall began to take on a more permanent shape, consisting of concrete sections and square blocks. Weak points were quickly identified and sealed. In mid-1962, modifications were made to strengthen the Wall, and in 1965, a third generation of Wall building began, using concrete slabs between steel girders and concrete posts. The last major reconstruction of the Wall began in 1975, when interlocking concrete segments were used. The border fencing off West Berlin from East Germany was 155 km. (96 mi.) in length. The actual concrete structure that became infamous was only 107 km. (66.5mi.) in length, the remainder of the border was sealed off by wire and fences. More than 300 watch towers were built along the border, as well as 105 km. (65 mi.) of anti-vehicle ditches, more than 20 concrete bunkers, and all patrolled by several hundred dogs and more than ten thousand guards. While the Wall was a formidable barrier that did not stop many East Germans from trying to cross it. In the first few days and weeks of its construction there were many gaps in the border. Escapees jumped, burrowed, climbed, and swam their way through weak points in the fence. Some East German residents lived in apartments that had windows and doors that opened into the West. Some fled to West Berlin simply by walking through their front doors, and when they were sealed, by climbing out the windows. Over time the holes and weak points in the Wall were found and blocked. Those attempting to escape in later years faced many more hazards, and while some were successful, many were wounded or killed in the attempt. The fall of the Wall. The collapse of the Wall was an even greater surprise than its construction, catching the East German politicians and border guards unaware. In 1989, there had been growing unrest in the GDR, with a number of mass demonstrations in East Berlin. A new refugee crisis was also causing problems for the East German authorities. The August, 1989, the opening of the Hungarian border with Austria provided a new gateway to the West. In just three days of September, 1989, over 13,000 East Germans fled to the West via Hungary. The East German authorities rushed through a number of stop-gap measures in an attempt to stem the flow of refugees, including the forced resignation of Honecker on October 18, and giving amnesty to those who had attempted to cross the border illegally. However, the unrest continued, and the refugees still fled. Then on November 9, 1989, Politburo member Guenter Schabowski gave a television interview in which he announced that East Germans would be able to travel abroad. When a reporter asked when this would apply Schabowski seemed unsure, but then said "immediately." Within minutes, crowds gathered at the border demanding to cross, but the guards refused to let them pass without orders. The East German authorities had intended for the new travel conditions to apply the next day, but in order to avoid violent confrontations, the border was opened. Huge crowds crossed the border, and an impromptu celebration erupted in both sides of Berlin. The Wall had been breached, and would not be closed again. Hilton, Christopher. The Wall: The People's Story. Stroud, Gloucestershire: Sutton Publishing, 2001. Read, Anthony and David Fisher. Berlin: The Biography of a City. London: Pimlico, 1994. Tusa, Ann. The Last Division: A History of Berlin 1945–1989. Reading, MA: Addison-Wesley Publishing, 1997. Berlin Wall Online. < http://www.dailysoft.com/berlinwall/ > 2003. Deutsches Historisches Museum Berlin < http://www.wallberlin.org/ >.